Judeo-Marathi (Marathi: जुदाव मराठी) is a form of Marathi spoken by the Bene Israel, a Jewish ethnic group that developed a unique identity in India and in Pakistan. Judæo-Marathi is, like other Marathi, written in the Devanagari script. It may not be sufficiently different from Marathi as to constitute a distinct language, although it is characterized by a number of loanwords from Hebrew and Aramaic as a result of influence from the Cochin Jewish community, Judæo-Malayalam and Portuguese and also some influence from the Urdu language. The Judæo-Marathi community mainly resides in Raigad and Thane districts and the city of Mumbai in Maharashtra. The majority of its members has emigrated to Israel, and most of the rest lives in England and Canada. 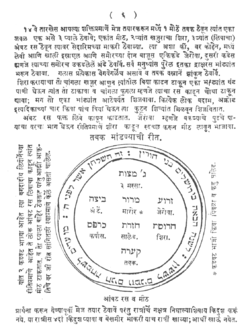 Recently, a rare Marathi-Hebrew text titled "Poona Haggadah", was found in Manchester. The 137-year-old book, which was used by the Bene-Israel community, was discovered by a University of Manchester historian, Yaakov Wise.